I am applying an IES Exam 2012. I have completed my Electronics and Telecommunication Engineering. Now I wanted to know Which books is very helpful for iES Exam. Could anyone help me by answering my question. 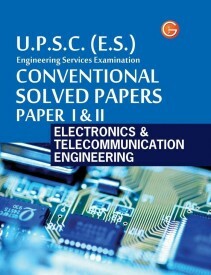 Re: Which books are helpful for E&T Engineering students for preparing for IES Exam? Below I have mentioned the books names which you can refer for study.In those books you will get question papers of last 5 years of exam & lost of exercise to practice.Cost of the books around Rs 450-500/-.You can buy from book stalls. Indian Engineering Services Examination, UPSC (Union Public Service commission) conducts Engineering Services Examination for recruitment in various engineering services/posts in various Government Departments. Jobs through IES are considered to be highly reputed therefore a large number of candidates appear for IES-ESE exam but there are only a limited vacancies so the selection is quite tough. Tell me about best books related to Food Technology for GATE exam?